You ever think Empress Katana, you can not out do the last video you purchased. Well, imagine getting a custom wher your fantasy comes true. Im not really the one to be told what to do. However, hearing you fantasies and knowing I can bring it into fruition does bring a smile to my face. I am all about one’s embracing and enjoying their fetishes and some fetishes are just not widely available. Sometimes you want a more personal feel, with your name, ideal outfit, key phrases that make you weak. Getting a custom video,audio or even custom task calendars can feel that void. Just like getting custom jewelry, a specialty meal, custom detailing on your car it will be custom pricing. While I favor my finsubs, human atms and guys that can’t help but hand over their money. I understand everyone’s budget but remember that is not mine or any Goddess, Domme etc concern. Custom content truly lasts forever so I expect to pay a premium price. My custom are usually 3x-5x more then my current cam and phone rates. You can always order directly via me make sure to email with as much detail as you like. A general idea and letting me run with it works as well. 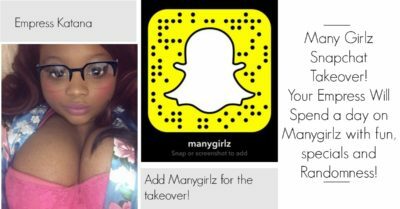 Your Empress Many Girlz Snapchat Takeover – Today!